1. Place sausage links in a preheated 375-degree oven for 3-5 minutes. Remove and set aside to cool. 2. Make marinade; combine olive oil, red pepper flakes, garlic in a small bowl. Set aside. 3. Heat grill to high. 4. Slice sausage into 1″ pieces. 5. Toss all skewer ingredients with marinade. 6. 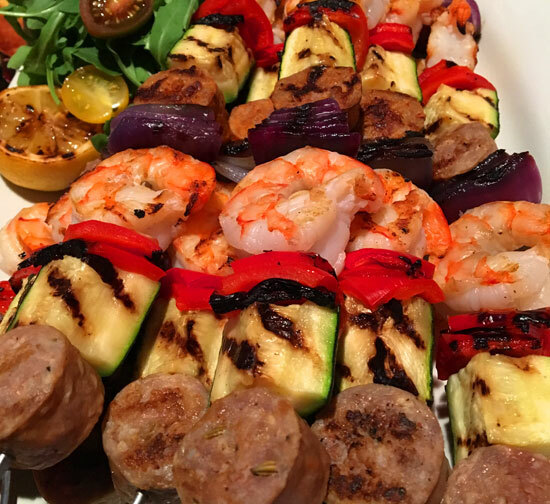 Assemble using metal skewers, thread zucchini, onion, pepper, sausage, shrimp, repeat. 7. Grill skewers for approximately 8-10 minutes, carefully turning as needed. *Use a pot holder to turn metal skewers. 8. Grill lemons for 3-4 minutes, cut side down. 9. Plate skewers, deconstruct 2 skewers and toss with arugula, tomatoes, and juice of grilled lemons over top and serve.